The Gepe storage chests are very robust and offer an excelent protection against dust and UV light. For easy storage the chests are stackable. 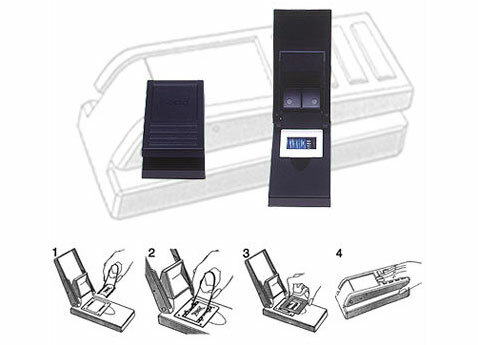 The slide trays are stored on a drawer which allows easy access to the trays. For archiving of 5×5 slides we have a clasical archiv-box for 50 mounts (3mm). The box is made up of 5 compartments. For 7×7 slide mounts we have a convenient Transfer Tray for 30 mounts. Our Rotary Transfer Tray easily interexcanges slide mounts with the Kodak 80 pictures carousel. The Rotary Storage Chest features a convenient drawer and holds our Rotary Transfer Tray or a Kodak 80 pictures carousel. The Rotary Transfer Tray with lid and the Rotary Storage Chest are available as separate products as well as a complete set. Fitting into the perforation the Gepe Tweezer was developed specially for the easy mounting of 35 mm films. 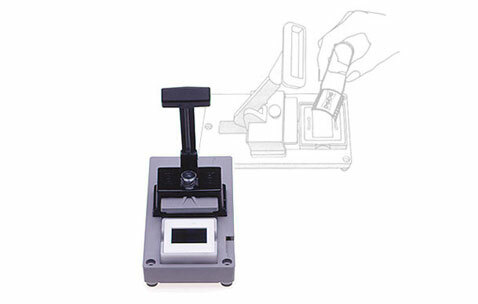 With this practical accessory the film is inserted into the metal mask clips easily and quickly. Finger prints or even mechanical damages of the slides are avoided. * To mount 8.5 x 8.5 cm slide mounts an adapter (Art. 8005) is used in in our hand mounting press for 7 x 7 slides. The universal film reels are produced by GEPE with the same quality level as for slide mounts and trays. Stored in the practical archive boxes they represent an attractive film library. All film reels have an automatic film catching device and come in an practical archive box which protects your films from dust and UV light. Our universal film reels fullfill the following standards – Super-8, Single-8 and Normal-8.